Belkin’s high-quality and super fast USB-C to Ethernet dongle is discounted to just $20.99. Its’ a bargain that will land you a high quality product in decent amount of money. WiFi is great, we know that, and it’s faster than ever these days. But there are still going to be some times where getting a wired connection is still the way to go. That’s not always the easiest thing in the world with modern notebook computers, especially those with an Apple logo on them. What you need is a dongle, and Belkin makes some great dongles including an Ethernet adapter. Right now one can be yours for a great price. 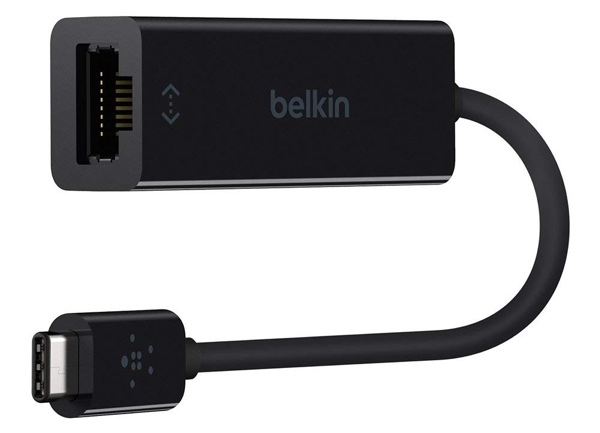 The Belkin USB-C to Gigabit Ethernet Adapter normally sells for around $28 and anywhere up to $35, but right now one can be yours for less than $21. That means that you can plug it into the USB-C port on your new-dangled Mac and get all the great stuff that comes courtesy of a a wired connection. In fact, this should work fine with a Nintendo Switch too, should WiFi be hampering your Super Smash Bros. battles. Right now this dongle is available at an all-time low price, so we don’t know how long it is going to last for. If you need an Ethernet adapter, or even if you think you might need one in the future, this might be the perfect time to add one to your dongle collection. Ethernet is the winner if you need guaranteed throughput and ping times, and we’d always recommend it over WiFi whereaver possible. I haven’t run into one situation where I’ve needed a wired connection in years.